As a kid, you probably loved nothing more than bouncing on a trampoline. But as an adult, when was the last time you tried doing a trampoline workout? As it turns out, trampoline jumping, or "rebounding," offers several key fitness benefits. This enjoyable, low-impact exercise can help you lose weight, strengthen your cells and, crucially, work a wide range of muscle groups including your core and abs, back, pelvic floor, thighs, legs and glutes. Which muscles does a trampoline work out? That's easy; it works out nearly all of them! Simply by bouncing on a trampoline every day, your glutes, thighs, legs, core, abs, back, buttocks and pelvic floor get a wonderful workout. If you're concerned about burning fat and losing weight, cardiovascular exercise like trampolining can put you on the fast track to your ideal weight. But unlike running or other high-intensity cardio work, rebounding is low-impact, meaning it's gentler on your cartilage, joints and vertebrae. And interestingly, according to a 2016 article published in Time, although trampolining has the same physical effects as biking or running 6 miles per hour, it actually feels much less intense than it is. This is because, as Dr. John Porcari pointed out in a study published by the American Council on Exercise, while the muscles may be working hard when you're rebounding, the trampoline absorbs some of the shock. This results in a less jarring, more enjoyable workout that still works all your major muscle groups. Read more: Is Jumping on a Trampoline More Effective Than Jogging? Back and stomach strengthening is one of the best benefits of doing trampoline work. Rebounding works out your whole core, as opposed to just your abdominal muscles, and keeping your core toned helps to protect your spine and lower back. Basically, when you're jumping up and down, your spinal muscles contract to keep your back stable and straight, and this in turns helps to strengthen your back muscles. Remember, focusing on your whole core is an important component of any well-rounded fitness regimen (trampolining for the win!). In addition, according to body alignment, fascia and movement specialist Lauren Roxburgh in an article for Goop, rebounding is great for the pelvic floor muscles. Your pelvic floor is a group of muscles in the pelvic area that supports the internal organs there. Having a strong pelvic floor is important for bladder control, stabilizing the hip joints and improving your overall sexual health. Bouncing on the trampoline (even for just 15 to 20 minutes per day) can greatly help activate and tone the pelvic floor. Rebounding is wonderful for your lower body, particularly when it comes to toning and shaping your legs, thighs and buttocks. Think about it: When you're jumping up and down, your legs are constantly working to help you maintain balance, as well as helping to control each jump. So, consistent trampoline workouts will inevitably lead to stronger, more toned thighs, buttocks and glutes. 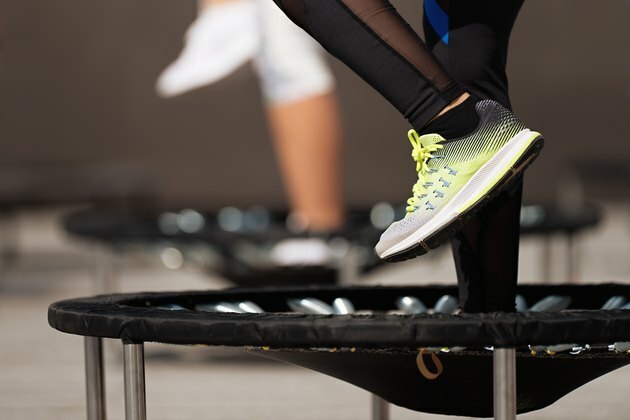 Best of all, you don't have to worry about putting too much strain on your lower body, since jumping on a trampoline takes the pressure off your knees and ankles, according to Dr. Axe. Repetitive bouncing on the trampoline can also help build calf and hamstring strength. All the parts of your calf and hamstring muscles are naturally activated when you're leaping up and down in the air, so you can expect to have stronger joints, slimmer calves and more shapely hamstrings, just by vertical jumping on the trampoline for 10 to 15 minutes per day. Just remember to warm up and stretch before your trampoline work out, to avoid straining your muscles: Quad stretches and walking lunges are great for this purpose. Which Is a Better Mini Trampoline: One With or Without Springs? Can Jumping Harm a Baby in the Womb? Is Roller Blading Better Than Running?